Melbourne is the sports, arts and cultural capital of Australia. What’s more, as a cutting-edge tech and transport hub within Australia – with its trains and trams (AKA cable cars) offering easy access to and from the city for the majority of residents. Melbourne will be most familiar to Brits as the setting of the long running Aussie soap opera Neighbours. Ridiculous plot lines aside, what you see on the screen is a pretty accurate reflection of Melbourne family life. The city has a highly diverse economy and population leading to a huge variety of cuisines, entertainments, nightlife and sub-cultures but it also benefits from Australia’s warm climate and excellent provision of public services. Melbourne is one of Australia’s oldest cities and the original Australian gold rush town. In the 1850s the discovery of gold in the region led to an economic boom which made Melbourne the world’s richest city and a population explosion which made it Australia’s largest. So prominent was Melbourne’s place in Australia at the beginning of the twentieth century that it was the first seat of government for the Australian Federation. All that history has left a legacy of beautiful Victorian architecture and town planning that few of Australia’s other towns and cities can match. 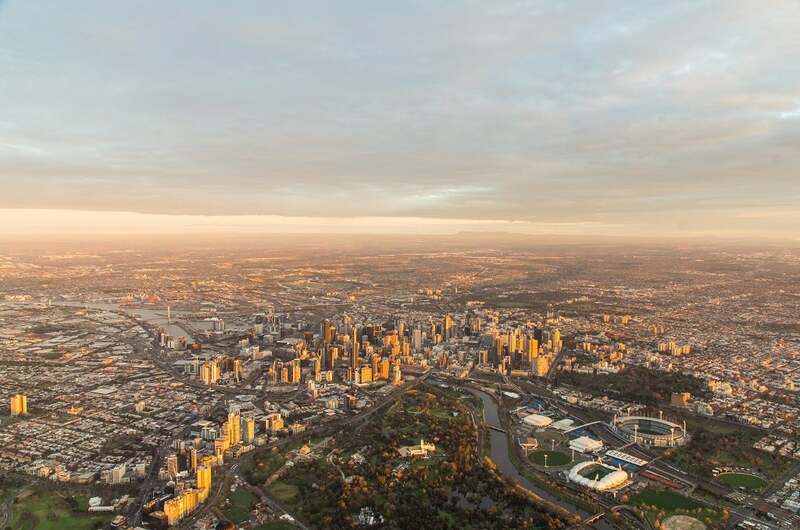 Wide avenues and large public parks make Melbourne an incredibly attractive city to live in – an attribute that’s enhanced by its position on a natural harbour at the mouth of the Yarra River. While Melbourne has long enjoyed a cheeky rivalry with its northern sister city of Sydney concerning its absence of a harbour, the city is situated alongside the world class Port Phillip Bay. With its greatest depth going to just 200m, it has represented an ideal starting point for the many divers, sailors and swimmers who wish to spend their summers in the waters of the Bay. Further, while surfers may struggle to get in many rides within the bay, a number of first rate surf beaches exists just a short drive outside the Melbourne city limit. In particular, there is Bells Beach, famed as a stop on the World Surfing Tour, and a regular pilgrimage for Melburnians keen to make the most of an evening or weekend surf. At present time Melbourne is experiencing a number of exciting and dynamic changes across its business and employment sector. While Sydney is Australia’s oldest city, Melbourne is its fastest growing – and with predictions it shall be soon be Australia’s largest – a number of global businesses are setting up headquarters within the city’s bustling economy. Alongside its arts and cultural sphere, the city is also Australia’s tech capital, and also offers the largest number of educational providers within the nation, rendering its university and tertiary sector a strong draw for employment. With a mix of local and international events, Melbourne has long ago cemented its place as sports central within Australia. Alongside hosting a trifecta of international events – the Formula One Grand Prix, the Australian Open tennis finals and the Melbourne Cup horse race – the city is also a regular stop on the WWE, UFC and even Premier League schedules. Indeed, with recent years seeing English clubs Liverpool and Manchester United drawing 100,000 in attendance for a friendly match, Melbourne is a city that any sports fan will easily find (no matter how unique or far away from home) a local club or fan group to join in the weekly fun with. Once you arrive in Melbourne, you’ll find it’s easy to see why with many of the great features of London – such as world class restaurants and galleries – yet also some fantastic beaches and waterways that offering great fun in the Australian summer and sunshine. Londoners moving to Melbourne will generally enjoy a much higher quality of life that isn’t just down to the sunshine. Melburnians have access to better healthcare, cheaper property, spend less time commuting and see less pollution. But they also have higher living costs – consumer goods, food, mobile phone and internet tariffs are all higher, groceries by as much as 40%. Culturally Melbourne can give London a serious run for its money in terms of quantity, even if it can’t quite deliver the same quality. Among Australian cities the Victorian state capital has more going on than most. Melbourne is widely regarded as Australia’s cultural capital. It’s the home of the Australian Ballet, the Melbourne Symphony Orchestra, a number of highly regarded theatres and the hub of the Australian film industry – indeed the world’s very first feature films were made in Melbourne. Street art and live music in abundance, international film and music festivals, a fringe festival, fantastic 19th century architecture including a World Heritage Site at the Royal Exhibition Building in the Carlton Gardens. For Britons moving to Melbourne, the climate shall be at once recognisable, yet take some time to adjust. Overall Melbourne is a city with a very manageable climate, its winters are cold but not freezing, its summers are hot but rarely boiling. While many Londoners may recognise the rain that is often a feature of Melbourne’s winter and early spring – with the springtime month of October oddly the wettest month of the year – it is also a city famed for the adage ‘four seasons in a day’. Accordingly, many Melburnians regularly are in the habit of dressing with versatility for work, at once ready to take a light coat for their morning train ride, yet remove it and their tie by day’s end to sit at a bar and take in the evening sunshine. Moving to Melbourne from the UK may be a long journey, but the process for making the move is best begun prior to departure. This is particularly so if you are moving to Australia for work – in which case you should ensure your employer sponsors your application for residency – and if intending to apply for permanent residency, or even citizenship. Though the UK enjoys a historic and ongoing close relationship with Australia (so like the UK’s membership with the EU allows for some red tape to be navigated faster) it is prudent to set the process in motion before you move so as to avoid any delay or complications. Whether a short or long term stay it is a good idea to register your presence with the consulate once you are in town; the British Consulate in Melbourne is located at 17, 90 Collins St within the heart of the Melbourne CBD.